How can the Moon rise through a mountain? 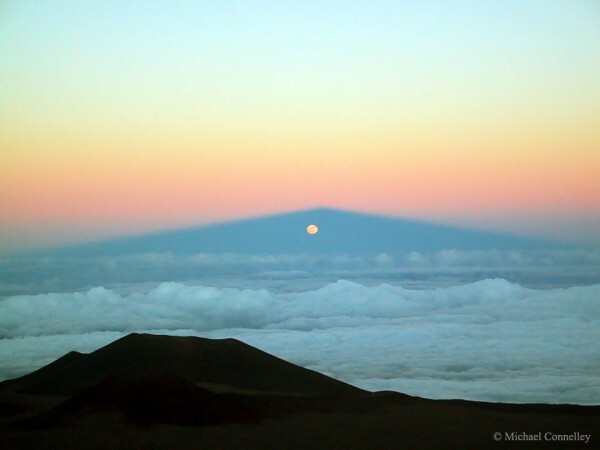 It cannot — what was photographed here is a moonrise through the shadow of a large volcano. The volcano is Mauna Kea, Hawai’i, USA, a frequent spot for spectacular photographs since it is arguably the premier observing location on planet Earth. The Sun has just set in the opposite direction, behind the camera. Additionally, the Moon has just passed full phase — were it precisely at full phase it would rise, possibly eclipsed, at the very peak of the shadow. The Moon is actually rising in the triangular shadow cone of the volcano, a corridor of darkness that tapers off in the distance like converging train tracks. The Moon is too large and too far away to be affected by the shadow of the volcano. Refraction of moonlight through the Earth’s atmosphere makes the Moon appear slightly oval. Cinder cones from old volcanic eruptions are visible in the foreground.